Carlos Alberto Wahnon de Carvalho Veiga born October 21, 1949 in Mindelo, was the second and the first democratically-elected Prime Minister of Cape Verde from April 4, 1991 to July 29, 2000. Carlos Veiga graduated from High School in Praia, Cape Verde, and continued his education in Lisbon, Portugal. He obtained his Doctoral Degree in Law in 1971 from the Classical University of Lisbon. From 1972 to 1974 Mr. Veiga worked in Angola as Registrar in the Civil Registry of the City of Bie`. He returned to Cape Verde in 1975 to become a public prosecuter and later Director General of Internal Administration, a position he held until 1978. In 1980 Mr. Veiga was appointed Attorney General. In 1982, differences with the Party in power led him to leave the Government for private practice. He also was elected President of the Cape Verdean Bar Association from 1982 to 1986. 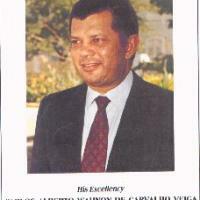 In 1985 Mr.Veiga was elected Member of the Cape Verdean Popular National Assembly. In the Popular National Assembly Mr. Veiga served on the Committee on Constitution and Legal Matters. In 1988 Mr.Veiga was re-elected to a second term to the Popular National Assembly. During this period Mr. Veiga became a strong voice against the one Party system and challenged the regime to open up for free and democratic elections. His position for democratic reforms were well known and respected by the people in Cape Verde. Mr. Veiga's ideas led in 1990 to the creation of an opposition Party in Cape Verde, the MpD (Movement for Democracy). During this Party's first National Convention, in October of 1990, Mr. Veiga was elected President of MpD and on January 13, 1991, led MpD to a major victory, by electing 56 out of 79 Deputies for the Popular National Assembly. Mr. Veiga was elected Prime Minister and formed the first democratically elected government of Cape Verde in January 1991. After another strong victory during the 1995 elections, Mr. Veiga was re-elected Prime Minister. Carlos Veiga was later succeeded by Gualberto do Rosario. He ran for president in the elections of 2001 and 2006, but narrowly lost both times to Pedro Pires.